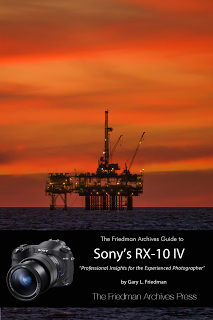 Sony Savant, Gary Friedman, has launched his new book (the "platinum owner's manual" -my advertising construct) for the Sony RX10iv. I'm supplying the link but am not directly involved nor harvesting affiliate cash. I've always found Gary's books to be well done, logical and easy to read. He's a clear voice in the photo world who seems capable of mastering any camera Sony can throw at him. If you have an RX10iv and you'd like a very good tutorial this might be the right book for you. ... and makes the argument that this battery finally helps mirrorless achieve parity with DSLRs; in the power management department. Apparently no one at DP Review actually tested the Panasonic GH5, GH4 or GH3 cameras and their batteries. Panasonic has been doing batteries correctly for years and years. And years. Even a cursory test would have shown that, when not using the built in flash, many users are able to get well over 1,000 still photo exposures while videographers tell of the GH4 cameras getting up to four hours of HD record time on a single battery! "One of the great advantages of the GH3's increased size is that it can take an unusually large battery for a mirrorless camera. The 7.2V, 1860mAh battery give 13. 4Wh of power, 50% more than the OM-D's battery, for example. This give the camera an impressive battery life of around 540 images per charge or 270 minutes of recording time." (The typo, "battery give" is still in the review but should be "battery gives"). I guess we should be magnanimous and welcome the editorial crew of DP Review into the mirrorless world of 2013 (the year the Panasonic GH3 appeared in shops). Glorious week for them. First Barney Britton's "non-hands on (un)real worldly recommendation of the Nikon D850 as his pick for "Gear of 2017" followed by blanket editorial amnesia of all mirrorless batteries pre-Sony A9. We wait for the next Italian boot to drop... will it be "Sony camera strap, accessory of the Year!!!"? I spent a year shooting the A7Rii. I never lived in fear or anxiety about its use of batteries.